Tension builds as we await hot summer nights in Los Angeles that go so well with BBQs, lounging outside, dinner with friends and all kinds of wines. You can tell folks are getting restless when Memorial Day arrives with a full dinner party calendar. We attended two and, what a surprise, wine was the theme. One was a little more structured featuring Argentina wines and wine glasses with the tBoW URL!! !and our host’s names in larger script – go figure. The second was more informal meandering through a cellar that needs purging. tBoW was careful to take notes for your information. 2007 Bartenura Moscato d’Asti $9: Summertime is for drinking Moscato d’Asti, the slightly sprtizy Itlaian wine that tastes like peaches and feels like 7-Up! This was bought at Costco. Another testament to the wine buyer there. I can only recall dreaming of the day any Moscato d’Asti might be in a Costco bin. Pinch me. It was so worth the $9 tag. 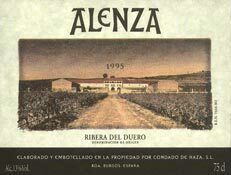 Prices for these wines have crawled higher in recent years so this is quite the bargain. Forget the tasting terms dictionary and the wine wheel. This is purr-fekt for that hot evening outdoors. Brilliant blue bottle. Oy! It’s kosher too. 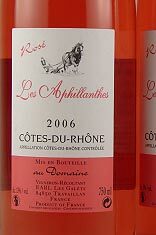 In case you did not already know..the alcohol on these wines are traditionally “lower”…like 5.5%!! We are not missing the “1”. 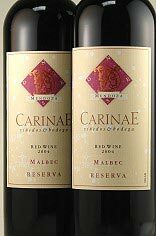 2004 Carinae Malbec Reserva $14: Purchased at The Wine Country. Briny, meaty nose. 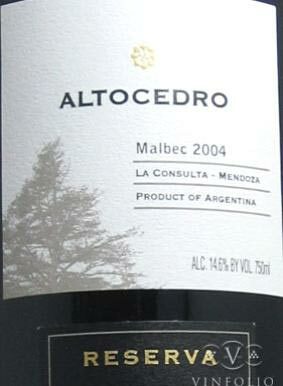 Not like many of the fruity and forward Malbec wines. Vanilla, baking soda, pumpkin bread. More mature in style. Maipu juice.